College is first and foremost about getting an education, and the way that colleges determine whether you have met the requirements necessary to say that you have earned your college education is through the use of grades. This isn’t new as the grading system is present from even before your high school days. However, this doesn’t mean that the grading system is exactly the same. Today we’ll talk about the importance of final exams when it comes to college. In high school, most of the time your final grade is determined by a multitude of various categories including homework, participation and of course the final exam (although in some cases that is replaced with, or even supplemented with a separate final project). Although the weights for each of these categories varies by the class, in general, there is a fairly even distribution of weight across all categories. On the other hand, college puts an extremely heavy emphasis on the final exam. The percentage that your final exam contributes to your overall class grade is often at least 50%, if not approaching the 80% range. Not only is that significantly more weight compared to high school, but when you really look at the numbers, you realize that the final exam essentially makes or breaks your grade. Especially when you consider the fact that coming into a final exam, most people’s homework grades or lab grades are very similar, the final exam is really the deciding factor when it comes to separating the A students from the C students. There is a lot more pressure in these final exams as well because they are almost always lengthy tests that take multiple hours to complete, something that is sometimes present in high school classes, but not always. 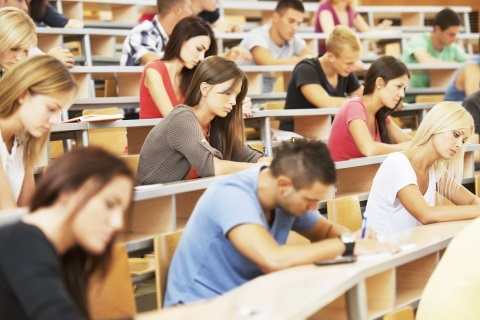 And based on the sheer number of students in the class compared to a typically smaller high school class, having a large lecture hall filled with hundreds of students all taking the exact same exam as you can amp the pressure up even more. The key to taking final exams is obviously to study the class material as much as possible. However, there is one often overlooked aspect that many students fail to take advantage of and that is the practice finals that professors often give out to the students to practice on. Not only can you use them to actually simulate the final exam from a time standpoint, but more importantly, they give you a good idea of the kinds of questions you will have in the exam. In fact, a lot of times, the final exam questions end up being nearly identical save for a few minor changes. So if you figure out how to solve these problems, you will have a lot easier time with the actual final exam when it really counts. While sometimes the answers to these practice finals are provided, making it much easier to determine how to solve the problems and thus prepare yourself for the real thing, many times the solutions are not explicitly provided. In this case, although it does require a bit more work, it is imperative that you go through the questions and fully determine the solutions and how to solve them. In fact, if the practice final exams do not have explicit solutions provided to the students, it is even more likely that similar questions will be used on the real final exam. So if you do go out of your way and figure out how to solve the problems, you will be at a distinct advantage over students who never bothered figuring out the solutions to the problems. College final exams are difficult, but they can be significantly easier if you put in the time to study. Even if there are no practice final exams available for your particular class, studying the course material and especially previous homework will make a huge difference in how well you do. As long as you don’t overlook the importance of the final exam when it comes to your final grade, you will more likely than not be well-prepared and end up giving your best effort possible! Transitioning 2 College © 2017. Powered by WordPress, with Positive blog Theme.